Who says you have to put your pup in a doggie daycare center when you go on vacation? Why not bring him or her along for the trip? Camping trips can be fun for dogs of any size, and it will give you both a chance to spend some quality time hiking and exploring. And you don’t have to rough it (pun intended) in a tent for the trip to be a success. Check out dog-friendly cabins at parks or lakes near you, and make it a double date by inviting a friend who has his or her own pup that can come along. A lot of dogs absolutely love the chance to have some water fun, whether that means hitting the beach, finding a hiking trail near a lake or exploring a nearby river together. Even if there’s a stream, creek or pond somewhere near home, you and Fido can spend a couple hours splashing around and playing fetch in the water. If you’re planning on getting in, though, save this one for the warmer days or pack a towel so you can dry off. Feeling some cabin fever after this winter? If so, now is your opportunity to get active in the great outdoors—and bringing your dog along is a great way to bond with each other and get a good workout in at the same time. Take out your bike, rollerblades or simply your jogging shoes, grab a leash and hit the pavement. Research some of the most dog-friendly parks in your city and do your outdoor workouts there. You may meet some other dog owners, and you’ll know you’re in an area where you and Fido can let loose. If you live in a dog-friendly apartment, your building management may provide a small off-leash area for dogs to run around and get some exercise. If you’re looking for somewhere with a little more space to let your pup have some freedom, research off-leash beaches or dog parks in your city. 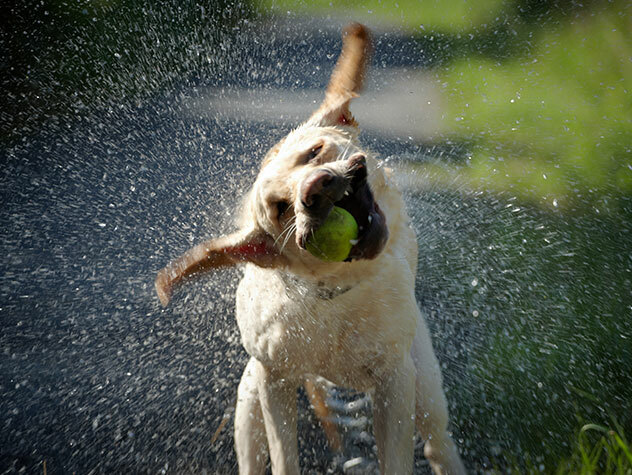 Bring along some tennis balls, a Frisbee or any other toy your dog will have fun chasing. Not only will Fido have a blast running around outside, he’ll also be able to meet and interact with some other dogs (just make sure you keep a close eye on those interactions in case either pup gets scared or aggressive). Is your dog still a puppy? If so, it’s important to get him trained so that he knows some basic commands, like sit, stay and lie down. However, competitive training takes these commands a step further by teaching dogs to jump through hoops and make their way through other obstacles in the course. Look online to see if there are any competitive training courses offered in your area. They’re often done outside, giving you both a chance to enjoy the spring weather. The next time you take Fido for a walk, look up some dog-friendly shops and cafes in the area that won’t mind if you both come inside. Pet supply stores, including larger ones like PetSmart and Petco are usually completely fine with dogs and cats coming in to shop with their owners, and you can both have fun walking around the neighborhood and window shopping along the way. Then, head to a dog-friendly cafe or patio where you can both relax, take in the sun and grab a bite to eat before heading home. No matter what you do, aim for getting outside with your dog at least a few times a week—you’ll both love the chance to soak in the sunshine and warm weather!